Media Filtration Systems with Fleck Valve Controls | Applied Membranes Inc.
AMI manufactures a large range of media filters for a variety of applications. Our media filters with Fleck Control Valves are equipped with Fleck Brand electromechanical automatic control valves for hassle-free regeneration and backwash cycles. Please click on one of our product lines below to view details for that application. Single Timered Water Softeners with Fleck Control Valves for Automatic Regeneration and Operation. 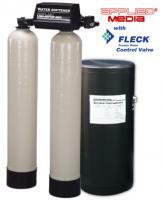 Single Metered (On-Demand) Water Softeners with Fleck Control Valves for Automatic Regeneration and Operation. Twin softeners are ideal when uninterrupted flow of soft water is a must. One resin tank is always in service while the other tank is in standby. AMI Carbon Filters are used to reduce chlorine, organics, color, tannin, objectionable tastes and odors, and dissolved organic chemicals from water. Calcite pH Neutralization Filters Raise the pH of water to a non-corrosive equilibrium with Fleck control valves for automatic backwash. Multi-Media Filtration is effective in removing dirt, silt, rust, and other suspended particles from a water stream to approximately 5 to 15 microns. Manganese Greensand filters reduce iron, manganese and hydrogen sulfide from water. Fleck Valve for automatic regeneration and backwash. Filter-Ag typically reduces suspended solids down to the 20-40 micron filtration rating with lower pressure drops and backwash flow rates.